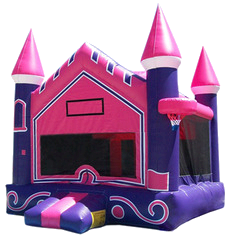 The Pink Castle BB 15x15 comes with 2 basket ball Hoops. One inside and one on the outside. 2 Pop ups, a safety step and lots of room to bounce. Be sure to add on basket balls for extra fun.